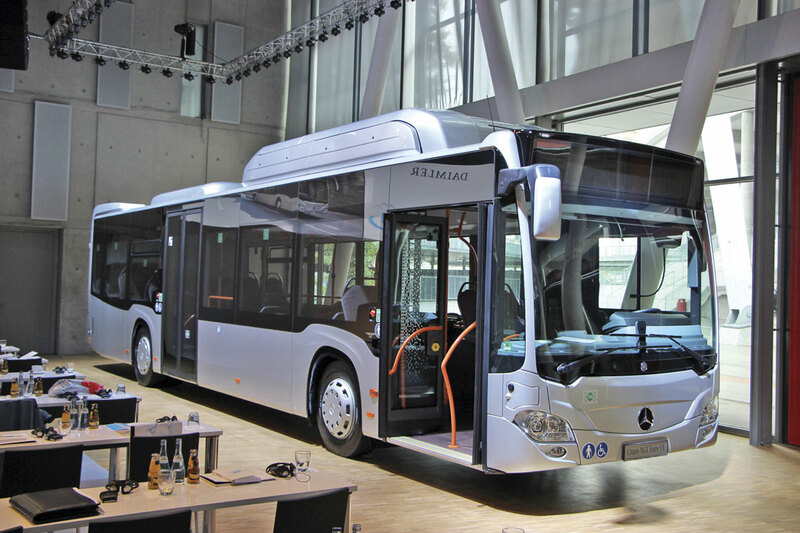 It is customary for Daimler Buses to hold a pre-Busworld press conference in Stuttgart to provide information on the exhibits it will show in Kortrijk. This year, the event was preceded by a visit to the manufacturing plant at Hosdere in Turkey, one of the biggest in Western Europe, which is celebrating 20 years in its current location. 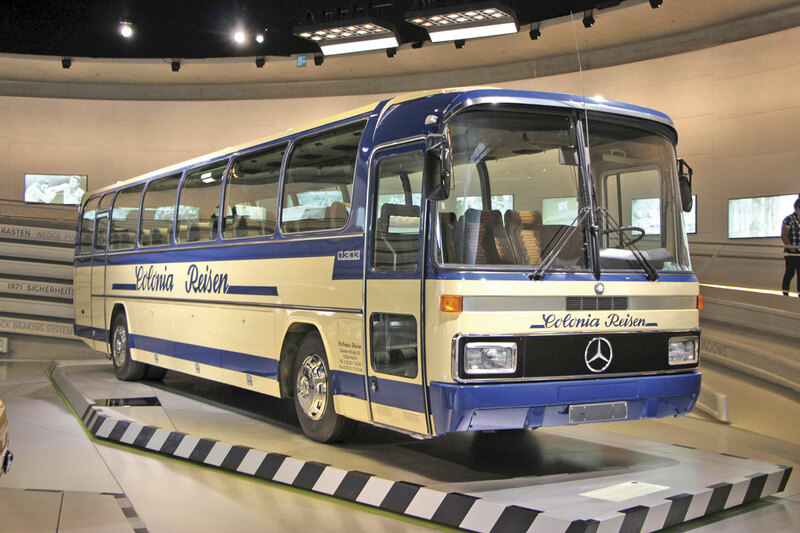 Stuart Jones was there throughout and even tagged on a visit to the fabulous Mercedes-Benz Museum in Stuttgart, a city currently experiencing a degree of turmoil in the name of enhanced public transport as the terminus main railway station is turned into a through station. With an increase of registrations of 13% in the first half of 2015 the European market was experiencing a slight recovery, though from a very low base. Things were more difficult in South America in the face of the economic situation where Brazil was down 27% on the first six months of the previous year and Argentina was down over 20%. Set against this, Daimler had recorded an 8% sales gain in Western Europe, despite a strong first quarter in 2014, selling 3,000 units. Market leadership was maintained with a 33.3% share, down from 36.2% in 2014 when it had benefited from being the first company to have an all Euro6 powered product line up. 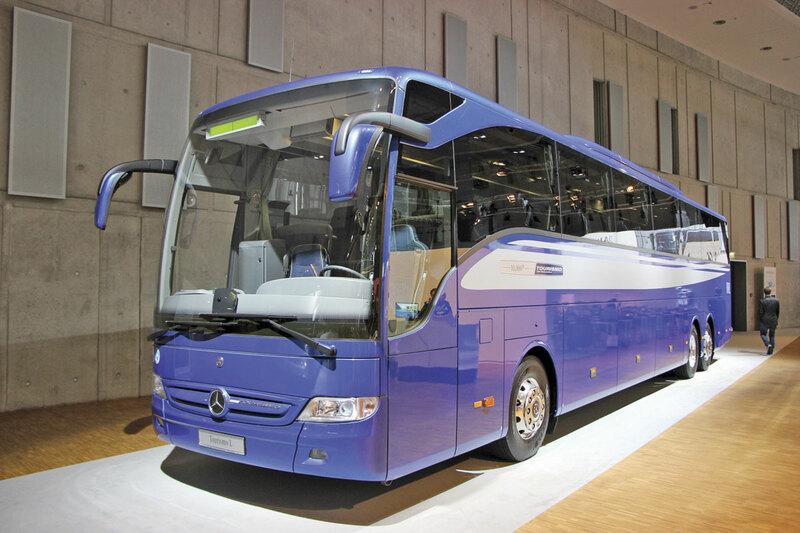 In Germany, market share was 49% with over 1,000 buses and coaches sold. In South America, sales of 6,200 units represented a 25% drop, although market share in Brazil had risen 7% to 53%. 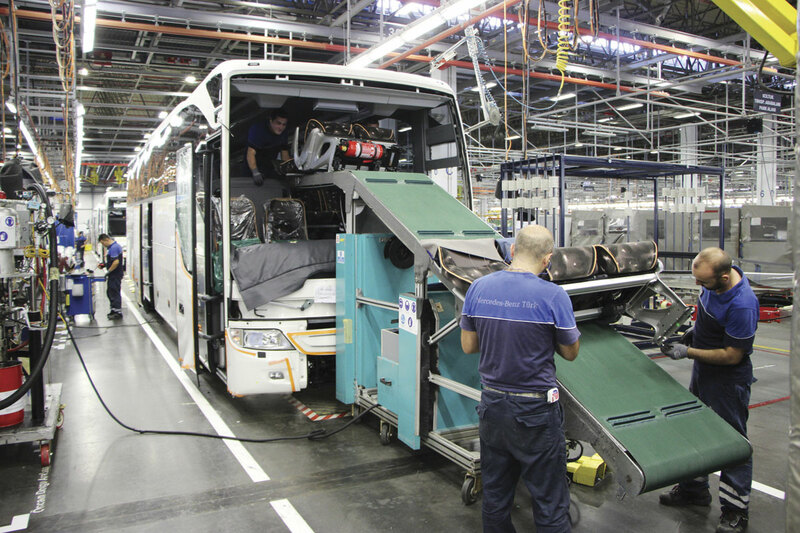 Worldwide, around 13,000 buses and coaches were sold in the first six months of 2015, 12% less than the same period in 2014, yet revenue was the same at €1.91bn because the increase in high value European sales offset the loss of chassis only revenue in South America. Earnings before interest and taxes (EBIT) dropped 12% to €91m and despite this sales return in the first half was 4.8% and 5.5% in the second quarter. For the future he believed that ‘customer focus is the best path to sustainable and profitable growth.’ He identified three priorities to achieve this goal: Developing new growth markets with Asia and particularly India high on the agenda; developing innovative business models and mobility solutions for tomorrow; and expanding the company’s innovation and technology leadership. In India, the bus market was expected to double in volume by 2020. The company had opened a new production plant in Chennai in May and this had a capacity of 1,500 expandable to 4,000 annually. In June, a new plant at Funza in Colombia had opened. Serving the Latin American market, it had a capacity of 4,000 chassis annually. The big news in launch terms was the unveiling of a new addition to the Citaro bus range, the Citaro NGT. Shown in 12m Solo form, though an articulated option is to follow, the NGT marks Daimler Buses’ return to the gas bus market after it had previously said that it did not see gas as the way forward. Visually it is distinguished from other Citaros by a large roof mounted pod towards the front of the bus containing the gas storage tanks. 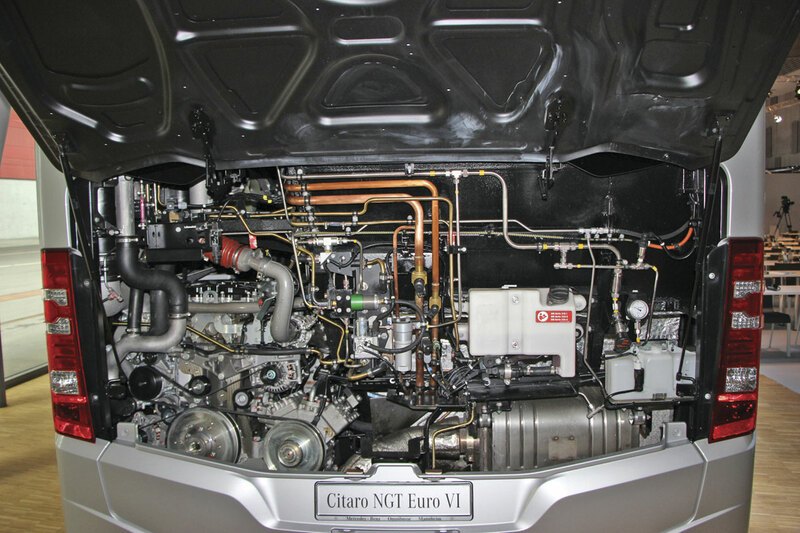 The Citaro NGT benefits from the new 7.7-litre M936G monofuel engine based on the latest generation OM936 design, which offers significant fuel saving and emissions benefits over earlier Mercedes-Benz OM447 gas engines. Some 230Kg light than the previous 12-litre engine, it has an output of 302hp/222Kw at 2,000rpm and peak torque of 1,200Nm at 1,200-1,600rpm. A savings figure of 20% was quoted, most of this achieved through the new technology but with a small contribution from weight reduction. If fuelled with gas from a renewable source, operation of it can be ‘virtually CO2 neutral’. Oil change intervals, usually shorter with gas engines than diesels, have been matched to the diesel at 60,000km and because the combustion process is virtually soot-free there is no need for particulate filters or SCR technology. Noise levels are a significant 4dB(A) lower than the diesel. An issue with gas buses can be range between refuelling stops but with a 27% increase in this regard compared with the previous generation it now matches diesel equivalent buses. A new storage system sees the gas stored in composite bottles with a plastic core and a carbon and glass fibre sleeve that combines stability and light weight. The capacity of each bottle increases from 190litres to 227litres (so less bottles are needed for the same range). A bottle container on the roof can carry between four and eight bottles depending on required range. It is mounted on a rail system integrated within the bus roof in order to prevent leaks. Overall the NGT is 3,389mm high. In all other respects the physical dimensions match the existing Citaro range. Exhaust gases can be discharged either upward over the roof or downward on to the road. Maximum passenger capacity is 96 in the two axle bus and 153 in the articulated, up from 93 and 149 respectively. In market terms, Germany has generally not been a big customer for gas buses in recent ears, though some others, notably in Scandinavia have. Across Europe, around 1,000 of the 10,500 urban buses sold annually are gas powered and Daimler now expects this to grow. Already the first examples have been sold, with Stadtwerke Augsburg GmbH, the Augsburg municipal operator, taking a batch of 68 units. Deliveries will start in December and will include 15 two-axle and 53 articulated buses. I asked Gustav Tuschen about the possibility of a right hand drive version of the Citaro NGT and he said that once work on the right hand drive articulated Citaro had been completed it would be possible, though it would depend on there being orders of sufficient volume to make it worthwhile. An interesting point he made was that the total cost of ownership of a Citaro NGT would still be higher than a Euro6 diesel Citaro, although presumably this will depend to some extent on the tax regime in particular countries. Daimler is continuing to work towards an electric bus future utilising a ‘common e-mobility platform’ for zero emission drive concepts. It anticipates the battery-electric Citaro E-Cell will be commercially available prior to 2020 (but not before 2018) and will be followed by the Citaro F-Cell fuel cell bus, which will benefit from components developed and used across the group. Mercedes-Benz developed completely new engine ranges for Euro6, which gave enhanced fuel economy among other features, with close to 14,000 Euro6 equipped buses and coaches delivered so far. Already the OM471 12.8litre unit has entered a second generation delivering a further 4% fuel saving, taking the total compared with the Euro5 equivalent to 12%. There are two variants: 476hp/350Kw delivering 2,300Nm or 510hp/375Kw delivering 2,500Nm. They have been available in certain coach models since last month. The savings have been achieved by the second generation of the X-pulse injection system; an improved asymmetrical charger with an exhaust turbocharger developed in house; higher compression; and a new patented exhaust gas recirculation control. In the engine there are new piston rings that reduce friction losses, a reshaped combustion chamber, a new injection nozzle with eight injection holes and the maximum rail pressure at the injector nozzle increased to up to 2,700bar. There have also been changes to the turbocharger, which is now built in house at Mannheim. It continues to work asymmetrically but distribution has been smoothed by moving the EGR valves forward into the exhaust manifold. Cutting the recirculation rate of the exhaust gas has helped optimise combustion. The sensors controlling the recirculation of exhaust gases and controlling the boost pressure have been removed, as has the wastegate valve previously fitted in the turbocharger. Optimum performance is delivered at lower rpm, and there is more power available lower down, equivalent to between 20-25Kw at between 800-900rpm. This last change together with changes to the shift strategy of the Powershift 3 transmission contributed the biggest part of the fuel economy increase. In answer to a question, Head of Product Engineering, Gustav Tuschen confirmed that work on a second generation version of the OM470 unit, as employed in the Mercedes-Benz Tourismo, is also going on, though this will not be as extensive a revision as that undertaken on the OM471. The OM471 is used extensively in the Setra range as well as in the Travego. 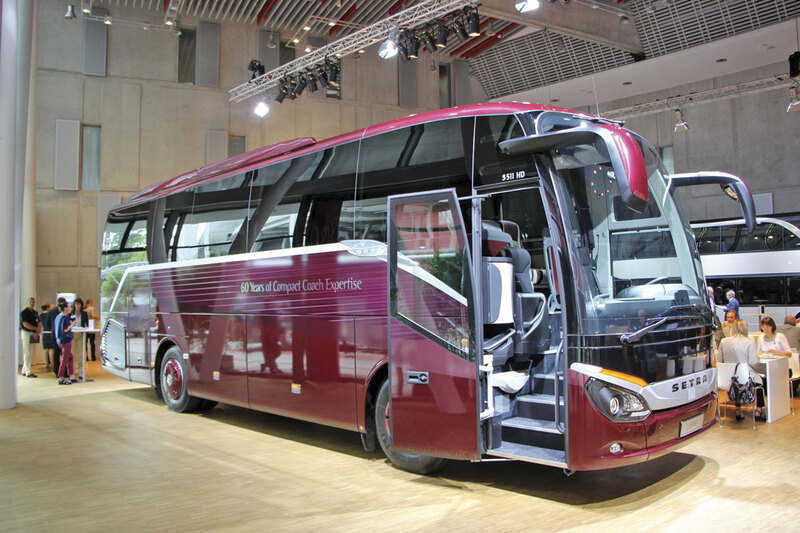 With effect from November 2015, there will be a legal requirement for all new coaches to be equipped with additional safety equipment, something Daimler buses is entirely relaxed about as it has been supplying them either as standard or options for some time. It first offered Lane Assist nine years ago, and Brake Assist six years ago. It has now progressed to Brake Assist 3 and offers adaptive cruise control and attention assist. A further innovation (that I saw demonstrated on ice earlier this year) is ATC (articulation angle control), which minimises the tendency to understeer. 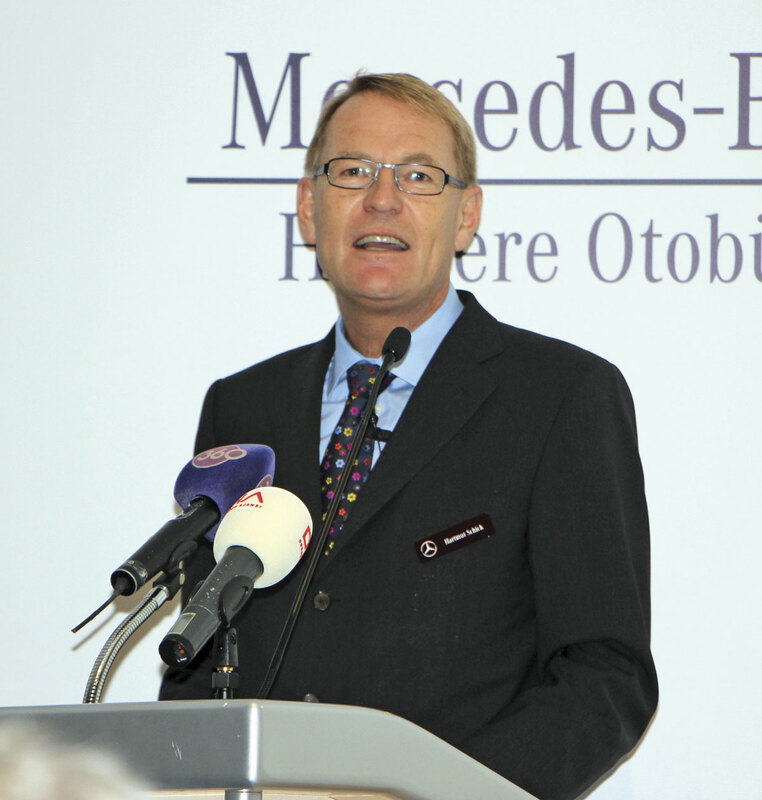 One of the speakers during the conference was a new face at Daimler Buses. 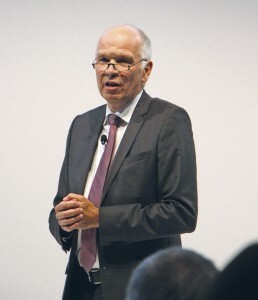 Ulrich Bastert (he’s heard them all) had taken over from Til Oberworder as Head of Marketing, Sales and Aftersales 64 days earlier and admitted that he was still learning about bus and coach having come from the truck sector and not been involved with bus previously. He had recently spent part of his holidays obtaining his full PCV licence. Another new face to me was that of Britta Seeger, the new Head of Mercedes-Benz Turk. She had previously headed up the Mercedes-Benz operation in Korea. 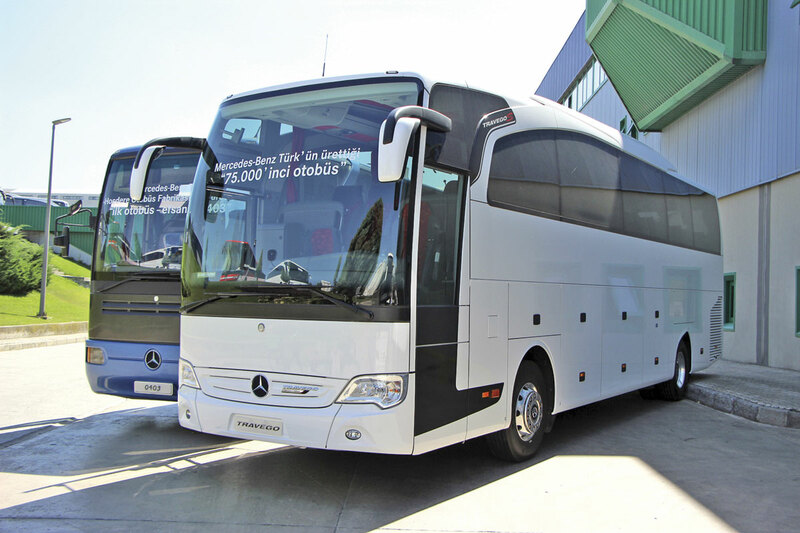 The main purpose of the Stuttgart part of the trip was to communicate news of the vehicles that will be appearing on the 2,600 square metre Daimler Buses stand at Busworld, Europe’s biggest dedicated bus and coach show. Ulrich Bastert gave a presentation that ran through what would be there from Mercedes-Benz, Setra, the service brand OmniPlus and the used vehicle brand BusStore. 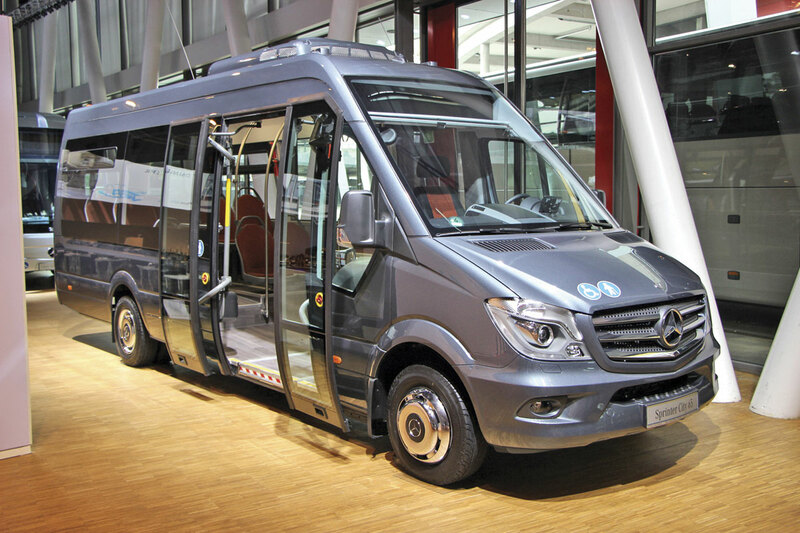 Foremost amongst the exhibits will be the 12.135m Citaro NGT, but other Mercedes-Benz products shown will include: the 10,000th Travego coach; a 13.99m wheelchair lift equipped Tourismo L that is fitted with a new adjustable headrest said to be safer and more comfortable; a 12.6m, 55-seat Intouro for schools and service duties; and a Sprinter City 65 low floor minibus equipped with various passenger entertainment systems. The latest OM471 engine will also appear. Representing the Setra brand will be: a Setra TopClass S516HDH; a double deck Setra TopClass S431DT; the smallest of the current Setra range, the ComfortClass S511HD; and the MultiClass S400LE Business low entry service bus. A new 14.6m version of the S400LE called the S418LE Business will be launched shortly after Kortrijk. Both BusStore and OmniPlus will be highlighted on the stand. The biggest news from OmniPlus was that it is moving into the provision of fleet maintenance packages sold as ‘Bus Depot Management’ whereby it undertakes the maintenance and service of an operator’s fleet, including vehicles of other brands. Such contracts are already operating in Utrecht, Moscow and Vienna, though I understand the very first such undertaking was that entered into with Go-Ahead in London for the articulated Citaros based at Waterloo. It was on 10 June 1995 that the then Turkish President, Süleyman Demirel, officially opened the Hosdere plant. At that time it was surrounded by fields though the intervening period has seen Istanbul spread out and new blocks of flats and industrial estates now encircle it. 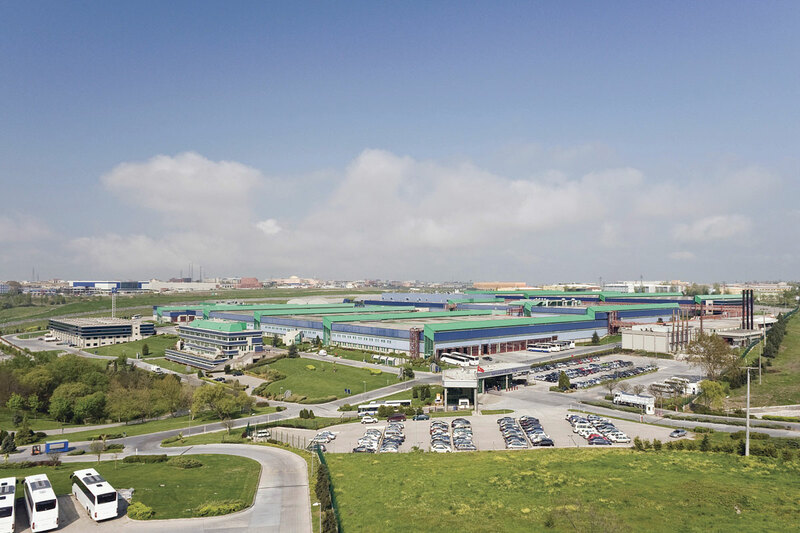 It was not the first Mercedes-Benz plant in Turkey as there had been a presence since December 1966 when a joint venture called Otomarsan A.S. between Daimler-Benz AG (36%) and two Turkish companies was established. This began producing the Mercedes-Benz O.302 under licence in 1968 at a plant at Davutpasa in Istanbul. Davutpasa continued in operation until 2007 but is no longer used. Another change was Daimler acquiring a 50.3% stake in Otomarsan in 1989 and changing the company name to Mercedes-Benz Turk AS the following year. It now has a 67% interest. Work on building the Hosdere plant started in 1994 and when it started production in mid 1995 the covered production area was 30,000 square metres with a capacity of 2,000 coaches annually. At that time it undertook the painting, assembly and finishing the O.350 Tourismo for Europe and the similar higher floor O.403 for Turkey as well as a lower height coach design and the O.325 bus and later the O.405. In 1996 an additional 50% was added to the production area and two years later a new building for manufacturing seats and also housing a training centre for 250 apprentices annually was built. 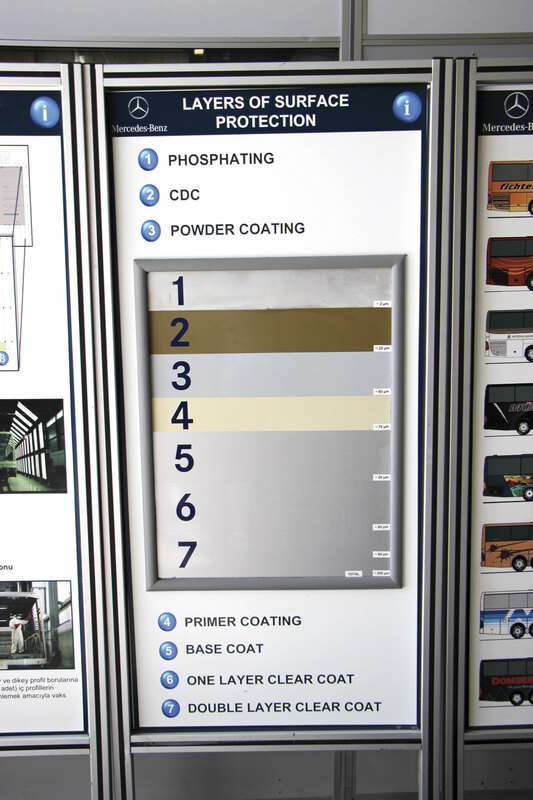 The paint shop was extended in 2000 and in 2004 a major step forward to complete bodybuilding was taken when a full electrical dip-coating plant was installed. A research and development centre was added in 2005 and in 2007 the parts operation was moved from Davutpasa from which time the entire bus could be built under one roof. Investment has continued since with the finishing building extended and a materials receiving building erected in 2009, an environmental management system installed at a cost of €1m in 2010, a new IT data centre and a fire station in 2012 and an extension to the R&D building in 2013. Last year a global IT-Hub for SAP Support was set up that will create jobs for 400 people. The most recent announcement is that a project to increase capacity in every area of the plant has been announced. Today the covered area has reached 139,000 square metres on a total site covering 360,000 square metres and employing 3,300 people (up from 533 in 1995). Today, Hosdere builds 35 derivatives within five different ranges. The ranges are: the Travego, the flagship coach in the Mercedes-Benz range, which is available exclusively in left hand drive; the Tourismo in all of its variations, including the right hand drive examples sold in the UK; the Intouro inter urban bus; the Connecto, a bus design that looks like a Euro5 Citaro but is more basic; and finally the Setra Business Plus range, a budget Setra MultiClass S415UL and S416UL Business bus range based on the 400 series, production of which started last year. 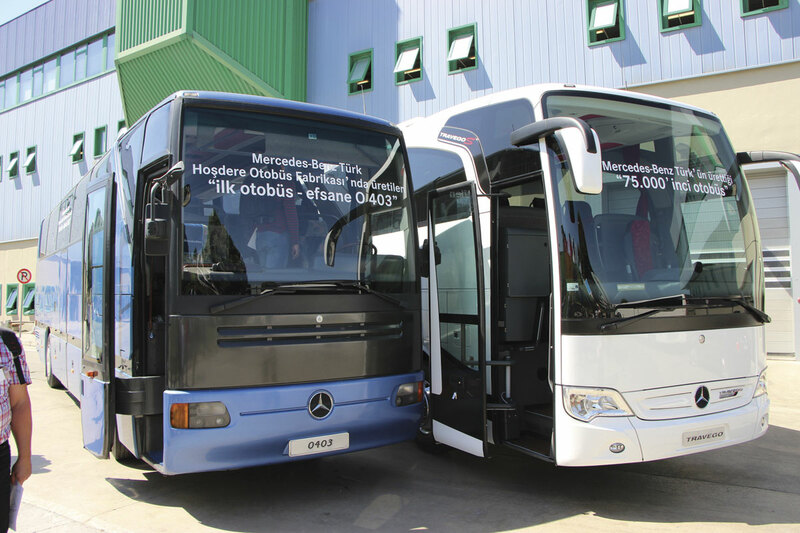 Quite a number of milestones have been reached recently, among them the construction of the 75,000th Mercedes-Benz bus and coach in Turkey, the 10,000th Travego and the 10,000th Tourismo of the current style. 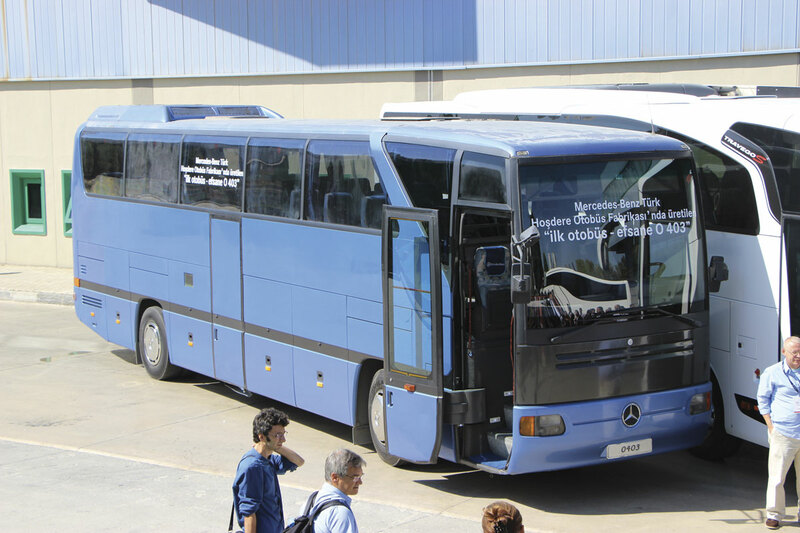 The 75,000th Turkish built coach was displayed outside the plant alongside the first coach built at Hosdere, a high floor O.403 model for the Turkish market. Production that started at six a day has increased to 16 a day with the potential for 18 a day, with a more complicated model line up. 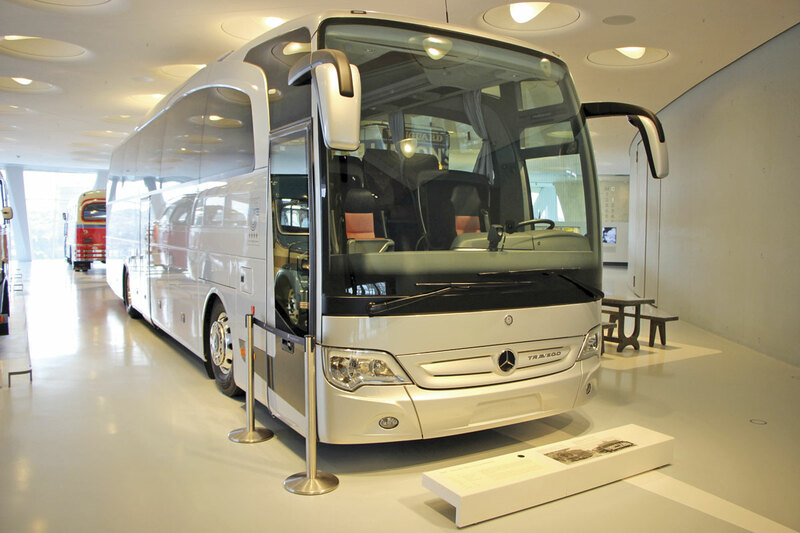 From the outset Hosdere has been the leading supplier to the Turkish coach market, currently enjoying a 64% share, and it now exports to more than 70 other countries including the UK. 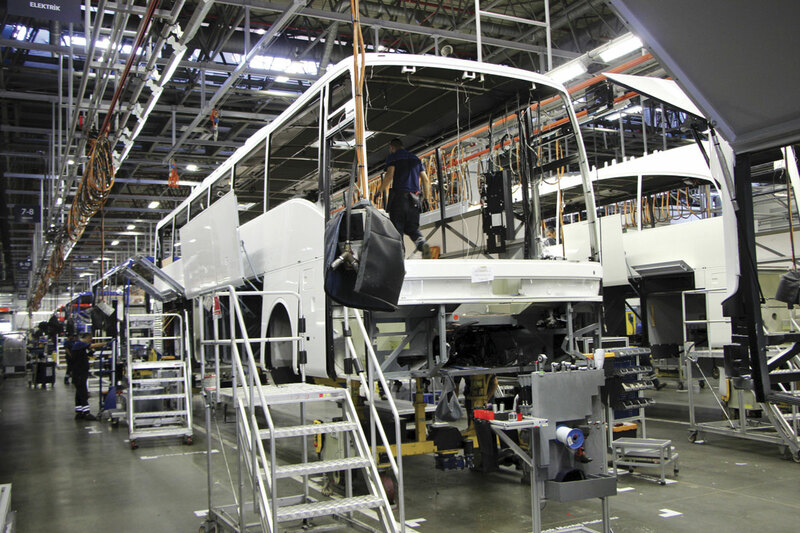 Production in 2015 is expected to be close to 4,500 units which is five times the 904 produced in 1995 and more than any of Daimler Buses’ other plants at New Ulm, Mannheim, Ligny en Barrois and Holysov. 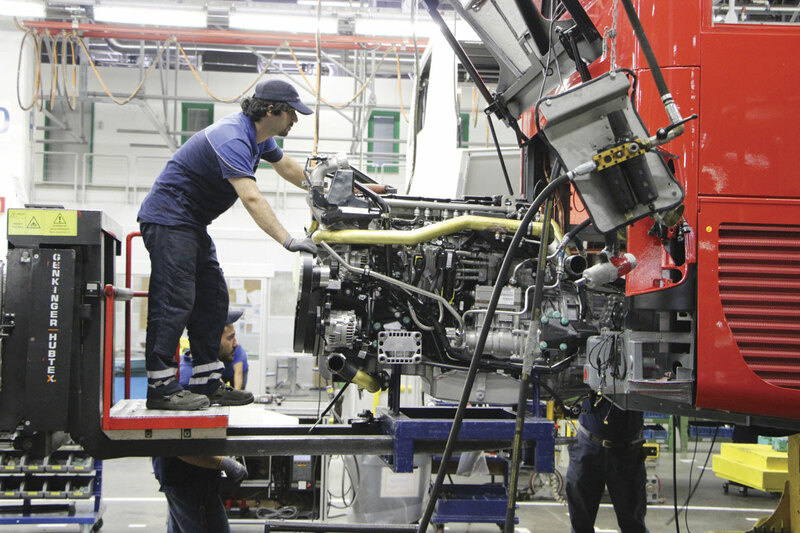 The factory is what Daimler refer to as ‘a full plant’ meaning it undertakes all of the key manufacturing stages; body shop, paint shop, assembly lines and finishing. It doesn’t mean that all of the components are built on site, though many (around 6,000) are. We were told that 24,000 different parts are purchased from 950 suppliers, over 60% of which are in Germany. We were given a guided tour of the plant with members of the team providing very detailed descriptions of the processes involved. Our tour started in the seat plant where 200,000 seats are manufactured annually. Sewing is done using machines, often operated by men, but cutting is done by a CNC machine that slices through 21 layers at a time. In the parts and body shop where the structures are constructed, we witnessed how well equipped the plant is and also how clean it is kept. The inventory runs to 86 CNC machines, 449 assembly jigs, two welding robots and 37 segment devices as well as presses and a variety of bending, bevelling and punching machines. 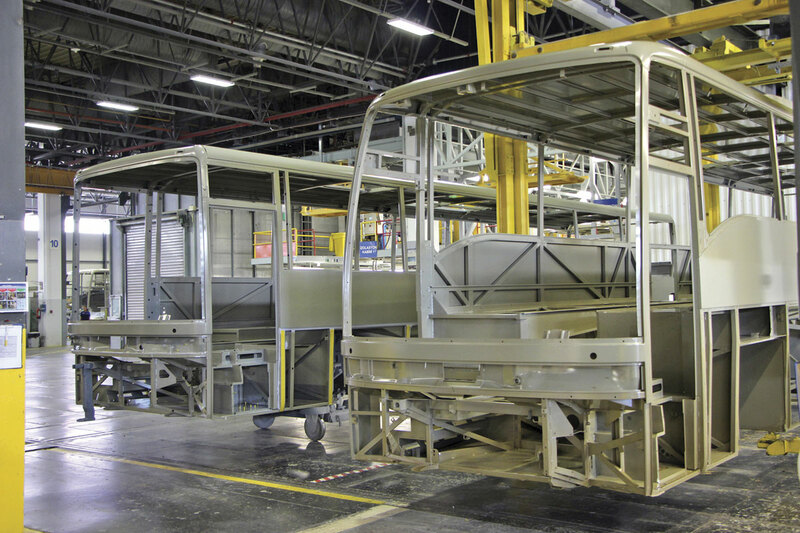 Constructed as separate front, middle and rear sections plus front and rear substructure frames, these key elements are brought together in three huge body assembly stations. The front, rear and roof are then welded to the underframe in two vast units called ‘Cathedrals’. 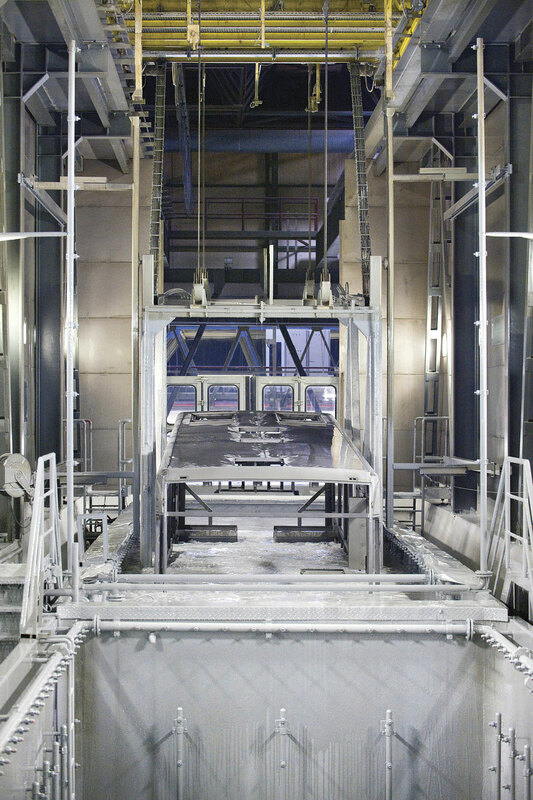 Once the frame is complete, it is pre-treated before going through a cataphoretic dip process that applies a zinc phosphate coating that protects the whole structure including the inside of the tubing. When all is complete it is washed and dried. Those parts that have not yet been attached to the body are treated separately in the same facility. Once the corrosion protection has been completed, the paint is applied and the structure then inspected. The next major stage is assembly which takes place at 34 stations on a U-shaped line with vehicles on parallel tracks. Each line builds any of the five different models produced in the plant. Within the U are four pre-assembly islands supplying the lines. Coaches move backwards along the first section, at the end of which the driveline is installed. By the third stage of the U they are on their wheels, propelled by an ‘easy mover’ roller device beneath the rear wheels. Windows and bulkheads are installed before the seats go in through the front screen aperture. Once the interior is complete and the windscreen installed the engine is started for the first time. Finally, the vehicles goes to the finishing shop where everything is checked in detail before a 15 minute deluge test, a run on the on-site test track and a 50km road run before the final inspection. In addition, one of each model a month undergoes a full audit. Once signed off, vehicles are either driven to their delivering dealership or shipped from Istanbul to Trieste in Italy from where they are driven on so that the clock will not have more than 1,500km on it when delivered. It will then undergo a pre-delivery inspection before it goes to the customer. Another aspect of the plant we were shown was the extensively equipped Material Test Laboratory which are fully certified and can undertake outside work as well as work for other parts of the Daimler empire. This represents a €7m investment. Every material used is tested here, whether fabrics, rubbers, oils, metals, plastics or whatever. I won’t pretend I fully understood what they were doing but it included: spectrometric analysis with an optic emission spectrometer; induction coupled plasma ICT analysis; horizontal burn rate tests; ozon resistance tests; thermo gravimetry analysis and something involving a potentiometric titration device. We have carried an article on the Mercedes-Benz Museum in the past so I won’t go over that again but it really is worth a look if you are ever in Stuttgart. Set over seven storeys, the design is based on a double helix and bus and coach products get generous representation among the many cars. The earliest is the 1895 Benz Omnibus which seated eight. 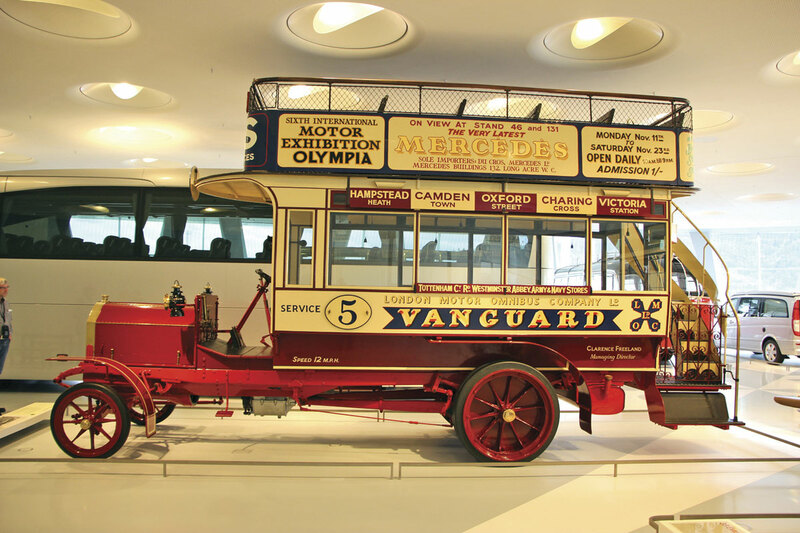 A real surprise for many visitors will be the sight of a 1907 Milnes Daimler double decker that served with Vanguard in London and carries their livery. The four-cylinder engine produced 28hp/21Kw. 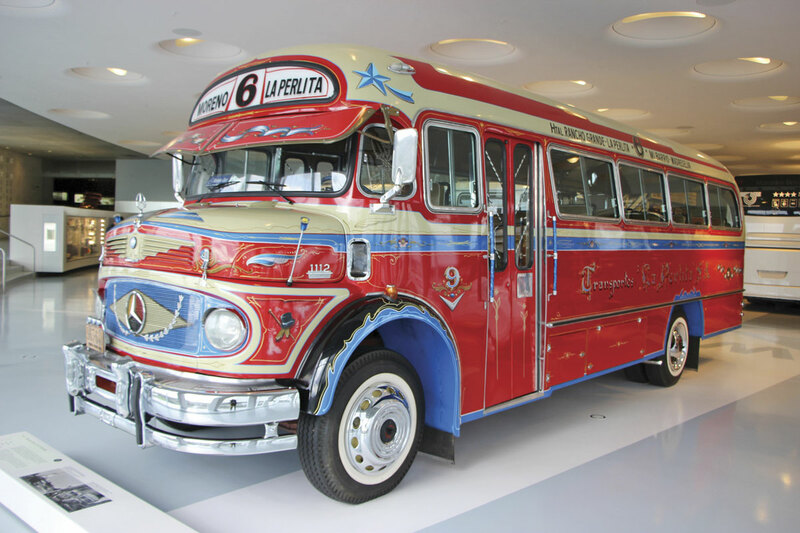 Another overseas exhibit is a 1969 LO1112 bonneted coach from Argentina. Other bus and coach exhibits include an O.302 in the guise of the German team coach at the 1974 World Cup, a 2009 Travego, a 1940 O.2600 Allweather coach; a 1980 O.305 service bus from the local Stuttgart fleet; a 1952 O.3500 Allweather coach; and a 1979 O.303 coach of Colonia Reisen whose address was on Daimler Strasse in Hurth. It was rather a packed three days but it gave me a surprising level of insight, not only into how Daimler buses builds its vehicles, but also into what it is introducing in the future and a reminder of where it has come from.